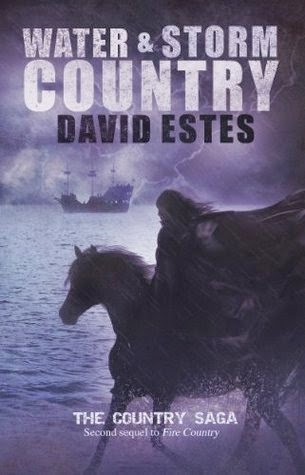 Water and Storm Country is the third book in The Country Saga by David Estes. Available at Amazon. Of all the books in both The Dwellers and The Country Sagas, this has been my favorite. There's something about it that reminds me of The First North American series by Kathleen O'Neal Gear and W. Michael Gear, albeit set for a in the future rather than the past and geared for a younger audience. As with the previous books, new characters are introduced in a new environment but this time there are POV changes between two new characters, Sadie and Huck, from two new groups of people, the Stormers and the Soakers, in two new environments, Storm Country and the sea. Plus, the new characters eventually make contact with characters from previous books so there's a lot going on here as all three books in The Country Saga come together. All the books in The Country Saga introduce new slang; aside from the first book, where I had to adjust to new words/meanings, I haven't struggled with the language. This book features one new slang word - yar for year - which totally makes sense when you think about the setting (a ship) but the word kept throwing me off because it looked like a typo. Something else that struck me while I was reading this book is all the stuff that goes unsaid between the books, particularly in regards to the love-plots. Estes' leaves a lot of room for the imagination - we see relationships form but the romantic situations that follow are left for readers to dream up between books, which makes the story self-adjusting to each reader depending on age/maturity/experience. I've made a note of this clever ploy in my writing journal so I don't forget it.